Do your teeth force you to think twice every time before you smile or say a word? If so, you’re far from alone. Many of our patients, even those with healthy teeth, feel self-conscious about their smiles because of noticeable flaws, but a solution is easily available thanks to cosmetic dentistry. 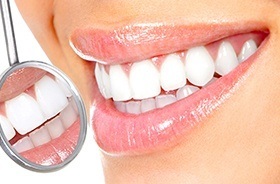 Using the treatments detailed below, we can make any imperfection disappear and help you achieve the big, bright, and beautiful teeth you’ve always wanted, usually in just one or two appointments. Sound too good to be true? It isn’t! Give us a call to learn more. “How are their teeth that perfect? !” If you’ve ever thought this while watching TV or a movie, you were likely looking at porcelain veneers. A go-to treatment for famous actors and singers alike, this procedure involves placing thin ceramic coverings over the teeth that can change their shape, size, and color to whatever you want. They are always custom-made to deliver the best results, and you can get one or an entire set in just two easy appointments. Want to fix an annoying chip, stain, or gap, but don’t want to break the bank doing it? Direct bonding is the perfect balance of affordability and effective treatment that can dramatically improve your smile’s appearance. A composite resin is applied to your flawed tooth, and then we’ll sculpt it in such a way that it completely hides any blemish. The procedure only takes about an hour, is 100% painless, and the results can last for up to 10 years. Have a wedding, date, or job interview that will be here before you know it, and you’re worried that people will notice your stained teeth? You can brighten them in just an hour or less thanks to our Zoom! Whitening treatment. Combining a powerful bleaching gel with a special low-UV light, we can break up and eliminate even the most stubborn stains in record time. This one procedure can easily make your teeth 6-8 shades brighter! Our at-home whitening kits allow you to literally brighten your smile while you surf the web or binge your favorite show. 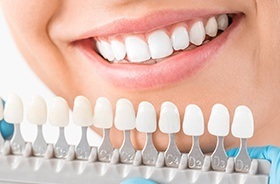 We’ll provide you with a set of mouth trays specially-made for your smile as well as a bleaching gel that is much more concentrated than anything you’ll find at the store or online. All you have to do is use our kit for about 30 minutes a day for 2 weeks, and right before your eyes, you’ll watch as the glow is restored to your smile. 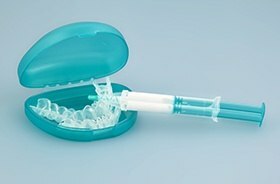 Do you have an overly-prominent gum line that causes your teeth to look short and stubby? This is known as a “crowded” smile, and it’s a very common issue we can fix here at New Haven Dental Group. 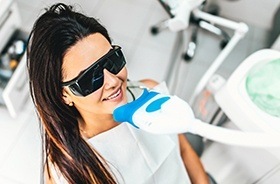 Using our soft tissue laser, we can painlessly remove any excess gum tissue to instantly make the teeth appear longer. We can then reshape the new gum line along the teeth or place a crown or veneer over a tooth to completely transform its appearance. For some patients, just one procedure isn’t enough to help them achieve their smile goals, and for them, we would recommend our smile makeover plan. For this, we put together a fully personalized collection of multiple procedures designed to work together that will dramatically enhance the look and health of your teeth at the same time. Over the course of a few appointments, we’ll turn the smile of your dreams into a beautiful reality you’ll be able to enjoy for a lifetime to come.